If you frequently need to move your gun safe around for one reason or another, you need a modular gun safe. I bet you are probably tired of always having to figure out how to move around that conventional safe you have at home. Traditional gun safes are heavy and they contain layers upon layers of steel or other thick metals that make them heavy, bulky, and stay put in one spot. 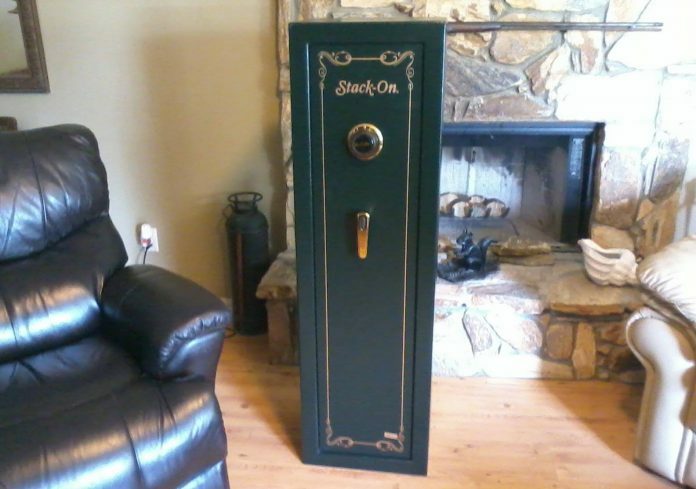 While traditional gun safes do their job really well, they are not usually the easiest things to move around. Modular gun safes are like any other large gun safe on the market, except, a modular gun safe will come delivered to you in multiple pieces that you assemble. This type of safe allows your to easily take apart and re-assemble your safe piece-by-piece, should you need to move it around. Before reading this, you might want to check out the gun cabinet vs gun safe comparison that we have prepared for you. In this review, we will be taking a look at our top 3 picks for the title of best modular gun safe on the market. SnapSafe has made a huge name for themselves in the gun safe market for several years now by producing some of the absolute best modular gun safes available. The Titan Modular Gun Safe is one of their most recent offerings, and it is exceptional. 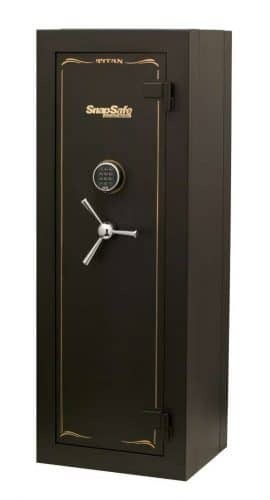 This safe gives you all the security you have come to expect from more conventional gun safes thanks to its thick 9 gauge steel exterior walls, a sledgehammer and pry-bar resistant 3/16″ solid steel “non breach seal” dead bolt door, and 8 one-inch chrome steel live locking bolts that work smoothly with the safes spring-loaded relocker. The interior is equipped with a 9 slot full gun rack, adjustable lined shelves, and can hold 12 or more long guns. There is enough space here to not only hold your firearms, but also all of your holsters, scopes, and maybe even your range bag. The Titan Modular Gun Cabinet can be assembled in just minutes with the wrench that is provided with it. It weighs in at a total of 400 pounds when fully assembled and stands at 59″ tall. If the Titan still isn’t quite big enough to meet your needs, you can always opt to buy one of the larger versions such as the Super Titan, or the Super Titan XL. When you combine an all steel core and a security tested 3-point locking system, you get the heavy duty Stack-On 8 Gun Security Cabinet. This modular gun safe is a short but stout gun cabinet that is capable of holding up to 8 guns. You can easily store away long guns, side by side shotguns, or make use of the interior shelf to hold your handguns and a few boxes of ammo. The interior features a foam-padded bottom to keep your firearms from scratches and accidental rough handling when storing them away. And if that doesn’t put your mind at ease, this safe also prominently features patented molded barrel rests for all of your firearms. 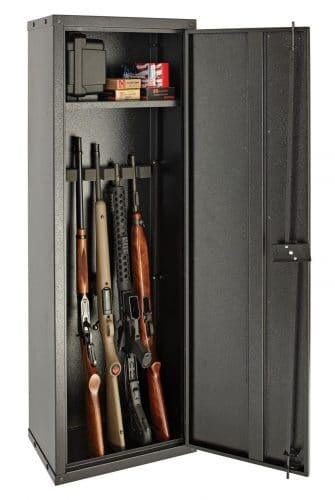 This modular gun cabinet is one of the most compact and lightest safes that we’ve featured in this review, measuring at only 21″ tall and weighing in at just 70 pounds. 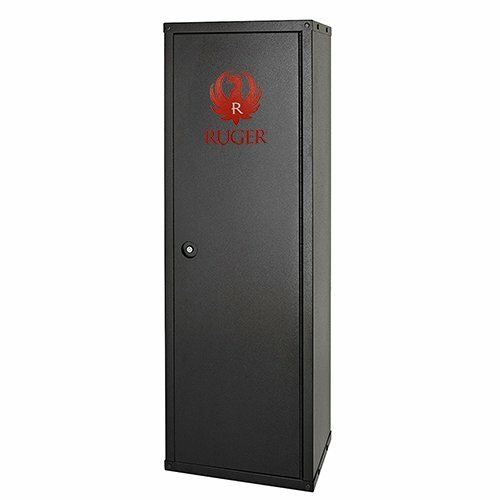 This Ruger branded modular gun cabinet from SnapSafe is constructed of 20 gauge steel that is powder coated on both the exterior and the interior to give it a sleek look while also providing the utmost level of protection for all your firearms. The interior of the 75050R features a shelf at the top of the cabinet that is large enough to hold a few handguns, a couple boxes of ammunition and a few other accessories like a pair of rifle scopes, your bug out bag, and smaller tactical accessories that you want to keep locked away until you need them. To hold your rifles and shotguns in place and to keep them free from getting scratched up from rubbing against the steel walls, SnapSafe has included an adhesive-backed rifle rest that can hold up to 4 long guns. The featured locking mechanism for the 75050R is a keyed entry lock. When you purchase this gun cabinet, you will receive two keys for the lock… just in case you lose one and need a backup. Standing 52.8″ high and weighing in at around 55 pounds, this sturdy cabinet is the perfect entry level, no-frills, modular gun safe. When you buy a modular gun safe, there are a few things that you need to be aware of, and take into consideration before spending that hard earned cash. The following three specifications are what we believe to be the most important, but it is not an exhaustive list by any means. 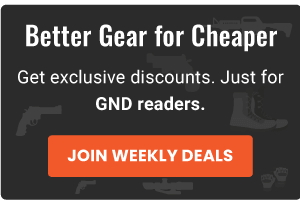 This is going to be the one thing you need to place at the top of your priority list because it covers most of the other pain points of finding and buying a high-quality modular gun safe. When you buy a gun safe, you do it because you have firearms or other valuables that you want to store away safely, and out of the wrong hands. To do this, you need a safe that can take a beating, can’t be easily pryed open with a crowbar, and preferably has a drill plate to protect the lock from being drilled out. 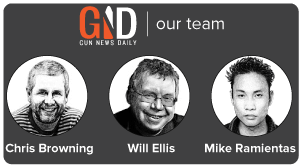 Does it have any gaps in the seams when it is fully assembled? What types of bolts and hinges does it use? What type of steel does it use? On average, 20 gauge steel will work just fine for most purposes. Is it fire or water resistant? If it contains interior shelving, are the shelves made with the same quality materials as the rest of the safe? And are they easy to remove or replace? Modular gun safes will typically provide you with roughly the same level of protection that more traditional welded steel safes give you. But beware that just as it is with anything else, you get what you pay for. The entire appeal of modular gun safes is that they are easy to assemble and easy to take apart. But they aren’t all made with the same level of quality, so ease of assembly can vary greatly in some cases. You should keep in mind that you are probably going to be assembling quite a few pieces to build your safe. It may not be the easiest thing in the world, but if it isn’t done correctly, you run the risk of your safe not operating properly. You are keeping your firearms and valuables in this thing, so one bolt out of place, or a hinge that wasn’t fully secured, and the integrity of your gun safe goes out the window. When choosing a modular gun safe, pick one that has wall seals that seat perfectly, bolts that aren’t overly complex to install, and most importantly, pieces that aren’t too heavy for you to lift to begin with. Just because these safes are modular and can be moved around one piece at a time doesn’t mean that it is any less heavy even when it is in pieces. On the light side of these safes, you may only be dealing with about 400 lbs of steel plates and other parts. On the heavier end of the spectrum, some of these modular safes can easily weigh in at around 800 pounds or more. When you are dealing with this type of weight, carrying pieces up large flights of stairs, over long distances, or in a vehicle, things can get complicated… and cumbersome. There really is no way around the issue of weight when it comes to high-quality gun safes. Simply put, it is a gun safe, you can expect it to be heavy. Whether it is a traditional welded gun safe or a modular safe that comes in several smaller portions won’t matter much if you still can’t move all those pieces easily. Choose a safe that won’t be overly cumbersome or too much trouble to move, but still provides you with better mobility than a conventional gun safe. Modular safes have become a very popular option among gun owners in just the past few years. They have many advantages over traditional safes, with about the same amount of downsides. The biggest of these downsides would have to be in terms of their overall weight and size. While modular safes certainly are a lot easier to move due to the fact that you can take them apart piece by piece, those pieces can still be cumbersome when it’s time to move it around. Pros and cons aside, if you are tired of never being able to move your conventional gun safe, you need to try out a modular gun safe to see if it suits your needs just a bit better.